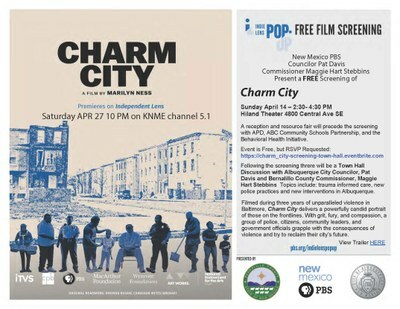 Indie Lens Pop-Up, presented by ITVS, Independent Lens, Bernalillo County, City of Albuquerque and New Mexico PBS present Marilyn Ness’ acclaimed documentary, Charm City. A town hall discussion led by Commissioner Maggie Hart Stebbins and Councilor Pat Davis will follow the film screening. The community is invited to this free event. Filmed over a violent three-year period when Baltimore’s nickname never seemed less apt, Charm City profiles a group of police, citizens, community leaders and government officials who, with grit, fury and compassion, are grappling with the consequences of violence and trying to reclaim their city’s future. Charm City premieres on Independent Lens Saturday, April 27 at 10 p.m. on New Mexico PBS / KNME Channel 5.1. For more information, visit: http://www.pbs.org/independentlens/films/the-providers/. Katy Chevigny (Producer) is an award-winning filmmaker and co-founder of Big Mouth Productions. Most recently, she produced Dark Money, which premiered at the 2018 Sundance Film Festival, and she directed one of the storylines in Kartemquin Films’ documentary series Hard Earned, which explores the lives of five American families struggling to get by in today's economy, and won a 2016 Alfred I. DuPont Award. She co-directed (with Ross Kauffman) the EmmyⓇ-nominated documentary E-Team, which premiered at the 2014 Sundance Film Festival. Chevigny has produced and/or directed 12 critically acclaimed feature-length documentary films through Big Mouth, including Deadline, Election Day and also 1971 with Marilyn Ness. Her work has won multiple awards, been broadcast on networks including PBS, NBC, HBO, Netflix, and Arte/ZDF, and has played at festivals around the world.